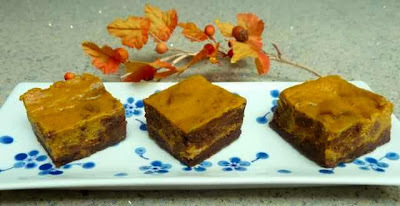 I am continuing my recent pumpkin theme with this recipe. 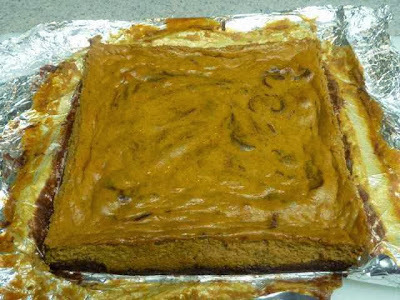 I saw a photo of pumpkin cheesecake brownies that looked so enticing that I had to make some. I used my brownie recipe and their cheesecake recipe. 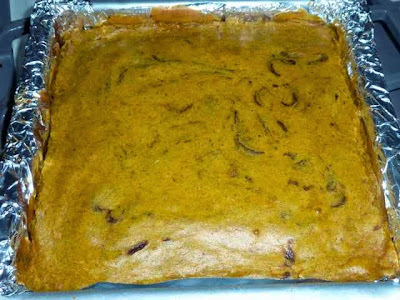 Some of the brownie batter is swirled into the pumpkin cheesecake batter. 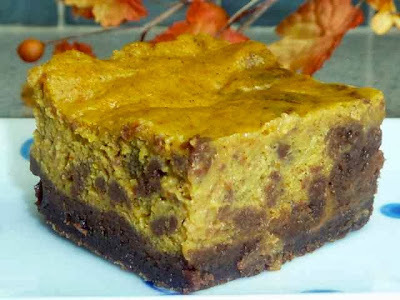 The brownies and brownie swirl comes out very fudgy and goes really well with the spiced pumpkin cheesecake topping. The cheesecake part is dense like a NY cheesecake. Next time I may try a great Italian cheesecake recipe I have with my brownies and see how a lighter cheesecake might work in the recipe. Chocolate and pumpkin spice definitely are a great pair that is worth repeating in various forms. The phone rang while I was putting the brownie batter onto the pumpkin batter and I lost my rhythm and when I returned to baking I forgot to take photos of the blobs of brownie batter on the cheesecake batter or a photo of swirling the brownies into the pumpkin batter or of the raw swirled batter ready to enter the oven. It was only after it was baking in the oven for a few minutes that I realized my omission. Sorry I don’t have the photos to show how to blob and swirl the batter. GLUTEN FREE PUMPKIN CHEESECAKE BROWNIES. Make one batch of my brownie recipe. 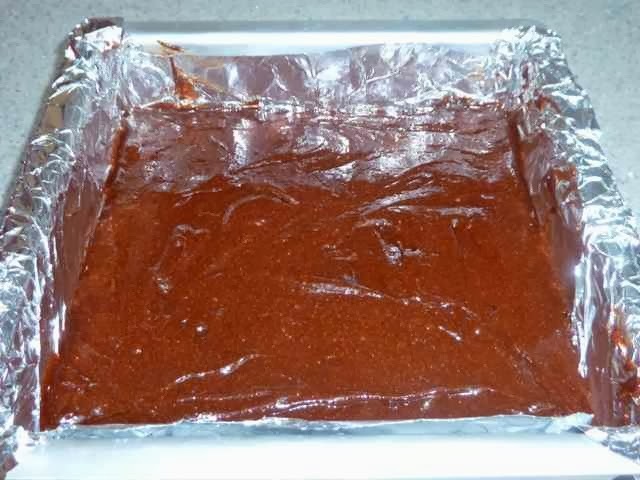 Prepare an 8x8-inch square pan by lining it completely with aluminum foil or parchment paper, leaving an over hang to grab so you can lift the finished brownies from the pan. First make the cheesecake. Beat the cream cheese until smooth in the bowl of a stand mixer using the paddle attachment or in a bowl using an electric hand mixer. Add the sugar and continue to beat a few minutes until fluffy. Scrape down the bowl and make sure the mixture is completely smooth. Add the salt and spices and mix well. whipped cream cheese, sugar & spices. Finally add the pumpkin puree and beat until it is well incorporated. Place the cheesecake batter in the refrigerator while you make the brownies. Make a recipe of brownies. 3/4 of the Brownie recipe spread in the lined pan. Place 3/4 of the brownie batter in the prepared baking pan and spread evenly over the bottom. Pour the cheesecake batter over the brownie batter and smooth out the top. Pumpkin cream cheese batter spread evenly over the brownie batter. Dollop 7 or 8 blobs of the remaining 1/4 of the brownie batter over the top of the cheesecake batter. Run the tip of a sharp knife through the batters back and forth in both directions to swirl the batters. Do not swirl too much or you will blend the brownie and cheesecake batters together, the aim is to keep them mostly separate. Bake for about 40 minutes or until the top of the batter is puffed up all over, even in the center. Baked brownies. Note that even the center is puffed up when done. Let the brownies cool completely in the pan before removing them with the foil or parchment paper. Cooled brownies taken out of the pan. For clean and pretty cuts, cool the brownies in the refrigerator for 2 hours before cutting into squares and also clean off the knife between each cut. If you are really into perfect looking brownies, you can trim the edges off before cutting the entire tray of brownies into 16 equal squares. Brownies cut into 16 squares. The knife was cleaned off between each cut. Store in the refrigerator. They are best eaten within 2 days of baking, but will keep for up to 5 days. GLUTEN FREE PUMPKIN SPICE CHEESECAKE BROWNIES. Ingredients CHEESECAKE 8 ounces Cream Cheese 1 cup Pumpkin Puree (not pie filling) 6 Tbs. Sugar 1/4 tsp. Sea Salt 1 tsp. Cinnamon 1/2 tsp. Ginger (dried & ground - not fresh) 1/4 tsp. Cloves 1/8 tsp. Nutmeg 1 large Egg 1/2 tsp. Vanilla Extract BROWNIES Make one batch of my brownie recipe. Directions Preheat the oven to 350 degrees. Prepare an 8x8-inch square pan by lining it completely with aluminum foil or parchment paper, leaving an over hang to grab so you can lift the finished brownies from the pan. First make the cheesecake. Beat the cream cheese until smooth in the bowl of a stand mixer using the paddle attachment or in a bowl using an electric hand mixer. Add the sugar and continue to beat a few minutes until fluffy. Scrape down the bowl and make sure the mixture is completely smooth. Add the salt and spices and mix well. 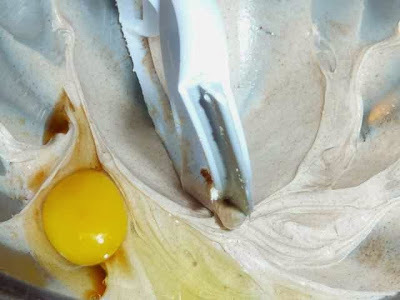 Add the egg and vanilla and mix well. 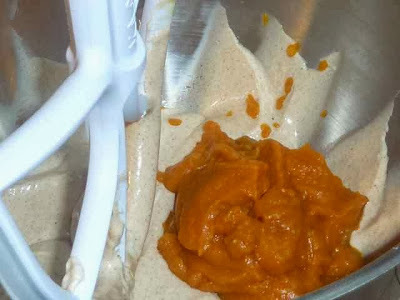 Finally add the pumpkin puree and beat until it is well incorporated. 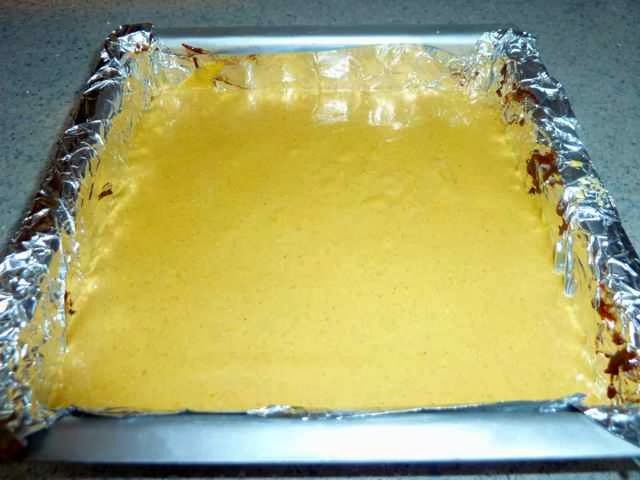 Place the cheesecake batter in the refrigerator while you make the brownies. Make a recipe of brownies. Place 3/4 of the brownie batter in the prepared baking pan and spread evenly over the bottom. Pour the cheesecake batter over the brownie batter and smooth out the top. Dollop 7 or 8 blobs of the remaining 1/4 of the brownie batter over the top of the cheesecake batter. Run the tip of a sharp knife through the batters back and forth in both directions to swirl the batters. Do not swirl too much or you will blend the brownie and cheesecake batters together, the aim is to keep them mostly separate. Bake for about 40 minutes or until the top of the batter is puffed up all over, even in the center. Let the brownies cool completely in the pan before removing them with the foil or parchment paper. For clean and pretty cuts, cool the brownies in the refrigerator for 2 hours before cutting into squares and also clean off the knife between each cut. If you are really into perfect looking brownies, you can trim the edges off before cutting the entire tray of brownies into 16 equal squares. Store in the refrigerator. 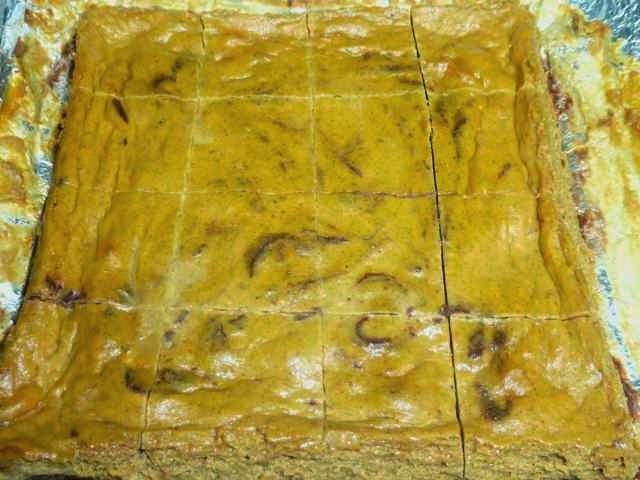 They are best eaten within 2 days of baking, but will keep for up to 5 days.